We set a record. Never before has a spacecraft explored anything so far away. Think of it. We’re a billion miles farther than Pluto [and] Just like with Pluto, we could not be happier. What you’re seeing is the first contact binary ever explored by spacecraft: two completely separate objects that are now joined together. The astronomical year got off to a flying start on January 1st, 2019 when NASA’ New Horizons vehicle – the same craft that flew by Pluto and Charon and their attendant moons in 2015 – shot past (486958) 2014 MU69, a trans-Neptunian Object (TNO) residing in the Kuiper belt. A relatively tiny object, and dubbed Ultima Thule, it wasn’t even known about when the New Horizons mission launched in January 2006. As I noted in my previous Space Sunday report, Kuiper Belt objects are of particular interest to planetary astronomers and scientists as they represent the oldest near-pristine material in the solar system, and so could contain many secrets, from how rocky planets formed through to the origins of life. 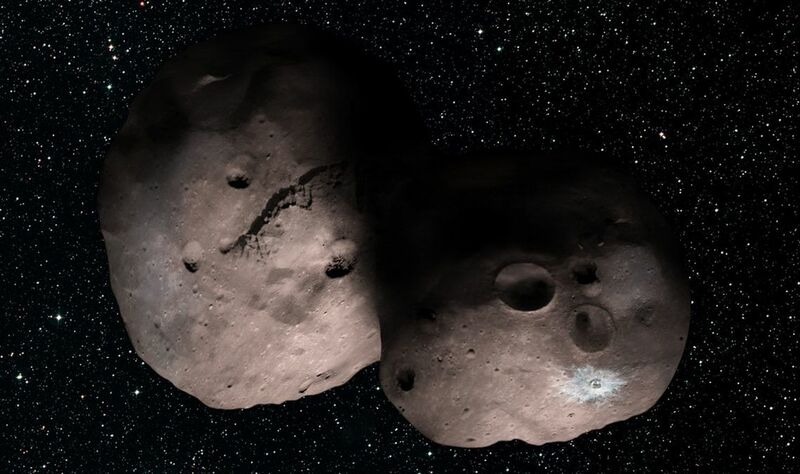 Ultima Thule itself has been of particular interest because data gathered from the Hubble Space Telescope (HST) suggested it might be a binary object due to its apparent brightness fluctuating, suggesting two bodies orbiting one another. However, as New Horizons slipped into the final days leading up to the fly-by, it seemed to report no variance’s in the light reflected by the object. The space craft reached its point of closest approach to Ultima Thule at 05:33 UT on the morning of January 1st, 2019. However, the nature of the approach, coupled with the huge distance between Earth and the vehicle meant that the first images and data wouldn’t be received for several hours after the probe has passed the object (it takes over 6 hours for radio signals to reach Earth from the vehicle), so at the time of closest approach, scientists and the public had to make do with the images received in the 24 hours preceding it. These images, captured while New Horizons was still more than 1 million kilometres (635,000 mi) from Ultima Thule, were enough to confirm that, rather than being either a single elongated object (as suggested by the lack of variance in brightness the probe was recording) or two objects orbiting one another, Ultima Thule is in fact a “contact binary” – objects conjoined after gently colliding with one another, to form a shape initially referred to as a “bowling pin” (this latter changed to “dirty snowman” as clearer images were received). They also revealed why New Horizons wasn’t seeing any brightness variations: whereas Hubble was seeing Ultima Thule from more of an “end on” angle (like a bottle tumbling through the air towards you), New Horizons was approach it more-or-less along its axis of rotation (like standing in front of a slowly turning propeller), so it was always reflecting the same amount of light. 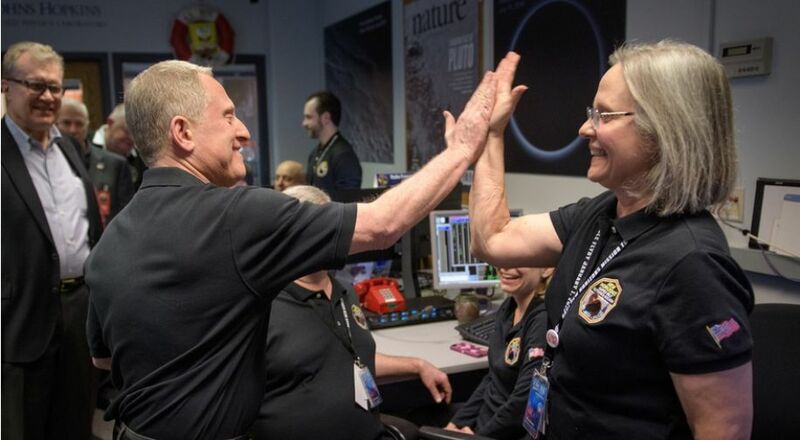 The initial images led members of the New Horizons mission team to call Ultima Thule the “first ever” contact binary object to be explored. However, this might be disputed; the nucleus of comet 67P/Churyumov–Gerasimenko, as seen by ESA’s Rosetta mission, as has two lobes connected by a narrow “neck” region which could mark it as a contact binary. Nevertheless, there is still something magical about the way the two lobes came together – as a member of the New Horizons team put it, the bump of them joining would have been so gentle, had it been caused by a car bumping your own, it wouldn’t result in any real damage. The lobes themselves are of unequal size; at 19 km (12 mi) across, the larger has been dubbed “Ultima”, while the smaller lobe has been dubbed “Thule”, and is 14 km (9 mi) across. Combined, these give the object an overall length of some 33 km (21 mi). That they came together so gently has already been seen as a confirmation of the pebble accretion theory of planetary formation. The exterior of both lobes is probably a mix of water, methane and nitrogen ices, doubtless mixed with other elements / minerals, and the reddish hue revealed in the colour images thus far returned is likely the result of the irradiation of ices on its surface – a process witnessed on Pluto. However, it will not until photographs taken much closer to the object – notably those at closest approach, a mere 3,500 km (2,200 mi) – are received in mid-February, that we’ll have a clear view of the object’s topography. Following the fly-by, the images received by mission control were taken at distances between 137,000 km (85,000 mi) and 28,000 km (18,000 mi) from the object, and part of the initial data transfer. In all, some 7 Gb of data was gathered, but due to the complexities involved, it will take 20 months for all of it to be received on Earth. In fact, at the time this article was written, and due to the passage of the Sun between the spacecraft and Earth, data transfer has been suspended for five days (January 5th through 10th, 2019) to prevent data loss due to solar interference. Even so, the images that have been received have been enough to not only reveal some of Ultima Thule’s secrets, but to also create new mysteries about it. One of these mysteries is that computer modelling suggests that given the way the two lobes came together, Ultima Thule should have a rate of spin to complete one revolution every 3 or 4 hours. However, data from New Horizons indicates it is spinning far slower: one revolution every 15 hours. So something must have slowed it down – the question is, what? The most obvious explanation would be the gravitational influence of nearby objects – say two or three small moons orbiting Ultima Thule. 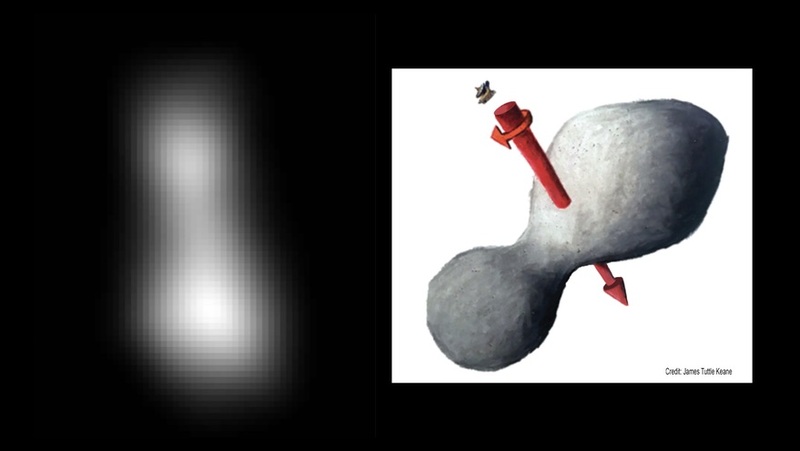 However, due to the risk of collision, the space around Ultima Thule was surveyed well ahead of the fly-by, and astronomers are convinced there is nothing orbiting it either beyond 800 km (500 mi) or closer than 160 km (100 mi) – although that does leave a fairly large sphere of space between the two which may yet reveal one or more objects. More will be known on this in late January, when data on New Horizons’ own studies of the space around Ultima Thule should be received by mission control. The discovery of a moon or moons orbiting Ultima Thule might not only provide a possible answer for the slow-down in the object’s spin, it could allow scientists to estimate the mass and density of the object with decent precision. And even if nothing is found to be in orbit, it doesn’t mean Ultima Thule has been forever without moons; orbital mechanics dictate that anything caught in its gravitational influence would over time move further and further way – much as the Moon as very slowly moving away from Earth. Eventually, a point would be reached where angular momentum would allow anything orbiting Ultima Thule to break free of its influence. This thing was born somewhere between 99 percent and 99.9 percent of the way back to T-zero in our solar system, really amazing. We’ve never seen anything like this before. It’s not fish or fowl. It’s something that’s completely different. [When the data comes in] there are going to be mysteries of Ultima Thule that we can’t figure out. Somewhat overshadowed by the hubbub surrounding the New Horizons mission, was the news that on January 3rd, 2019, China carried out the first successful landing on the far side of the Moon with the arrival of its Chang’e 4 lander, carrying with it the Yutu 2 rover. Named for the moon goddess of Chinese mythology, Chang’e 4 was launched on Friday, December 7th, 2018 (read here for more) and reached lunar orbit five days later. However, the landing was delayed until after the Sun had risen sufficiently to bathe the landing zone within the Von Kármán in light, allowing for a final survey the be carried out using the lander’s on-board cameras. This was actually achieved by the lander dropping slowly to a very low altitude over the Moon, then using its descent engines to “hover” over its proposed landing site, so that both colour and monochrome images could be returned to Earth and used to confirm there were no dangerous obstacles the might damage the lander on touch-down. Once on the surface, things proceeded rapidly. Image and data gathering commenced, while a series of checks were carried out ahead of deploying the Yutu 2 (Jade Rabbit 2) solar-powered rover, which rolled down its deployment ramp a few hours after the landing, marking the second time China has successfully deployed a rover on the Moon, the first being the original Yutu rover partnered with the Chang’e 3 lander that touched down on the Moon’s near side in December 2103. That rover suffered a “mechanical aberration” about a month into its mission, ending its perambulations, although it remained in communication with Earth until March 2015. It’s hoped that Yutu 2 will remain mobile throughout its 90-day primary mission period, and will be able to drive up to 10 km in the area surrounding the landing site. The mission has multiple goals. As I noted in a December 2018 Space Sunday, the landing site is situated in the South Pole-Aitken Basin (SPA), a 2,500-km wide, 12-km deep ancient impact crater which could contain exposed material from the moon’s upper mantle. Studying this material could reveal clues to the history of the Moon and development of the wider solar system. In addition, the mission will investigate subsurface conditions in the area and monitor solar wind interactions. As the far side of the Moon is uniquely radio quiet (no broadcasts from Earth can reach it), the mission will perform several radio astronomy experiments, this work supported by Longjiang-2(“Dragon River”) micro satellite, one of two launched with Chang’e 4, although the first failed to reach lunar orbit. Most interestingly, the lander carried a small “tin” in the lander contains seeds of potatoes and rockcress (Arabidopsis thaliana, a flowering plant related to cabbage and mustard, as well as a model organism for plant biology), and silkworm eggs. The hope is that the plants will support the silkworms with oxygen, and the silkworms will in turn provide the plants with necessary carbon dioxide and nutrients through their waste, with the idea of the two supporting one another, with the planets hopefully growing and blooming in the lunar environment. Because Chang’e 4 and Yutu are in a radio blind spot relative to Earth, they are communicating with mission control via a relay satellite called Queqiao (“magpie bridge” a name for the Milky Way as given in Chinese folk law), which is sitting in a halo orbit some 65,000-80,000 km beyond the Moon in the gravitationally stable L2 region, allowing it to can “see” both the lunar far side and Earth. Chang’e 4 is part of a rolling programme by China to expand its capabilities in space. It is the fourth mission to the Moon, and will be followed by an ambitious sample / return mission scheduled for launch in 2019. All of the missions are thought to be precursors for a human mission to the Moon, which China hopes to mount in the late 2020s. Thank you – great post as well!